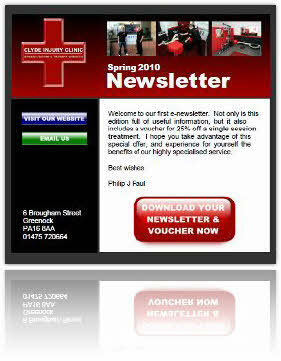 Elaborate email marketing templates are NOT essential to deliver highly effective and content-rich campaigns. As we saw in Part 2 of Using & Creating Templates, there are clear benefits from creating an email marketing newsletter in PDF format. This can then be delivered via a 'covering' email using one of the stock templates within your system or by creating your own customised templates. Click on the image below to see the online version and to download the PDF newsletter. There was too much content for a standard email newsletter, so we recommended using a PDF. This also meant that the response rate to the promotional discount could be tracked very precisely, based on the number of vouchers redeemed. Although the covering email was designed and created by us from scratch, it would also have been possible to adapt and use one of the free templates within our delivery system. Either way, having the ability to design a custom download button, adapt the colour scheme and incorporate pictures and logo from the business website is very important in customising email templates to match the business branding.